Tánaiste Frances Fitzgerald has resisted calls to resign over her handling of the garda whistleblower controversy and insisted that as Minister for Justice she could not interfere with the O'Higgins Commission. In a series of tweets, Ms Fitzgerald said this was confirmed twice in the documents released today by the Department of Justice and had been confirmed by the Attorney General. She said the Disclosures Tribunal would objectively judge the appropriateness of her conduct. She is due to give evidence at the tribunal in early January. A Government spokesperson said it retained full confidence in her. However, a number of ministers and Fine Gael TDs have told RTÉ News that they believe she should resign following tonight's revelations. Her comments came after it was revealed she was personally sent a letter from one of her officials in July 2015, which discussed the "aggressive stance towards Sergeant Maurice McCabe at the O'Higgins Commission". The letter is one of a number of documents published this evening by the Department of Justice from a trawl of records that were requested by Taoiseach Leo Varadkar. Mr Varadkar made the request last week over the controversy about a separate email that was sent to Ms Fitzgerald on 15 May 2015 while she was Minister for Justice. This email outlined the legal strategy of former garda commissioner Nóirín O'Sullivan that was about to be pursued against Sgt McCabe at the O'Higgins Commission. The release of the documents came as Mr Varadkar and Fianna Fáil leader Micheál Martin met to try to find a resolution to the current impasse between their parties. A Government spokesperson said that there was serious engagement on both sides and "all remain keen to avoid an election in the interest of the country". They are due to meet again tomorrow morning. The letter released this evening, which was sent to Ms Fitzgerald, was to inform her that a request had come into the Garda press office from RTÉ journalist John Burke. He had asked the press office to confirm that "at a recent session of the Justice Kevin O'Higgins Inquiry, counsel for the Garda Commissioner raised questions over the motivation of Sgt McCabe for bringing certain matters regarding alleged garda misconduct to attention". Copies of the query were also directed to the then garda commissioner Ms O'Sullivan for her comment. The letter sent by the departmental official to Ms Fitzgerald went on to discuss how best she could respond to the questions raised in the press query, as she was due to take part in an interview on RTÉ's This Week programme on the following day. It is the first indication that the line of aggressive questioning on Sgt McCabe at the O'Higgins Commission were personally notified to the Tánaiste, and as far back as July 2015. It was almost a year later before full details of the actual challenge to Sgt McCabe's motivation at the commission became public, when sections of the inquiry transcript were leaked. However, at that time, Ms Fitzgerald adamantly told the Dáil that she knew nothing about the attack on Sgt McCabe, nor indeed anything about the proceedings at the commission, which was held in private session. The email threads have been sent forward to the Disclosures Tribunal. The documents also show that Ms Fitzgerald was told that in July 2015, Sgt McCabe no longer wished to remain in his assigned role heading up the traffic unit in Mullingar and that he "blamed the commissioner" for his desire to no longer accept the role. However, the documents do not specifically mention that his discontent directly resulted from the commissioner's legal strategy at the tribunal, but it was a clear flag to the minister that Sgt McCabe was deeply unhappy with how he felt he was being treated under the commissioner. The documents also show that former commissioner O'Sullivan shared with the department the garda response to the RTÉ journalist's query, as well as the full set of questions that referenced the challenge to Sgt McCabe's motivation. Speaking on RTÉ’s Claire Byrne Live, Minister for Foreign Affairs Simon Coveney said we should wait until Ms Fitzgerald appeared before the tribunal before making a political judgement. On the same programme, Fianna Fáil’s justice spokesperson Jim O'Callaghan said Ms Fitzgerald would force the country into an election unless she resigned. He said: "I think the Tánaiste should recognise that unless she does stand aside, she is going to force this country into an election nobody wants, that nobody needs and is not in the country's interests. Sinn Féin's justice spokesperson said the documents show that it was time for Ms Fitzgerald, who is now Minister of Enterprise, to resign from office. In a statement, Donnchadh Ó Laoghaire said: "These documents are further evidence of the Tánaiste's failings in addressing very serious issues, and her failure to protect Maurice McCabe from an appalling smear. 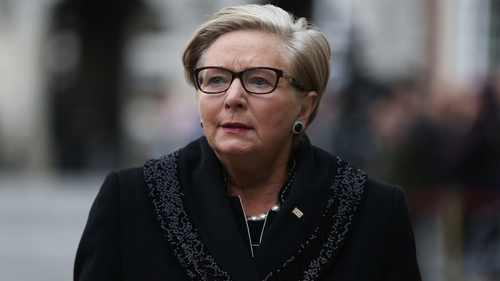 "The case for the defence for Tánaiste Frances Fitzgerald has been unravelling for days. It has now collapsed. "It is well past the time for the Tánaiste to resign; there is no more room for argument." Meanwhile, RTÉ News has learned that the Attorney General's office did not provide Ms Fitzgerald with legal advice in 2015 when it contacted her then department about the legal dispute relating to the treatment of Sgt McCabe at the O'Higgins Commission. Ms Fitzgerald has said that she received legal advice from the Attorney General that she could not intervene in the legal strategy of Ms O'Sullivan at the O’Higgins Commission. This evening, the Department of Justice confirmed to RTÉ News that the contact from the Attorney General's office was for information purposes only and "not legal advice". Politicians on the Government side have defended Ms Fitzgerald claiming she could not have intervened on the basis of what they said was the Attorney General's legal advice at the time. Responding to a series of questions from RTÉ, the Department of Justice said that "the AG's Office was providing information in the telephone call in question, not legal advice, however, as the email states both the senior official from the AG's office and the senior official in the Department of Justice were of the view that 'neither the Attorney nor the Minister has a function related to the evidence a party to a Commission of Investigation may adduce'".